Chances are, you don’t find this alarmist stranger’s argument very persuasive, but then again, you don’t work on Wall Street. 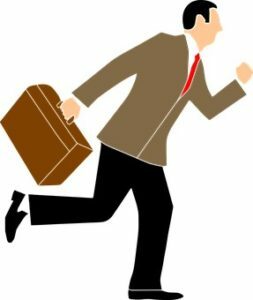 After hearing these benign government statistics, traders rushed for the exits from the opening bell to the closing, and on February 2 the S&P 500 stocks were, in aggregate, worth 2.13% less than they were on February 1. The Nasdaq Composite index fell 1.96% and the Dow Jones Industrial Average, a somewhat meaningless but well-known index, was down 2.54%. If you are not an alarmist, then you have something to celebrate. 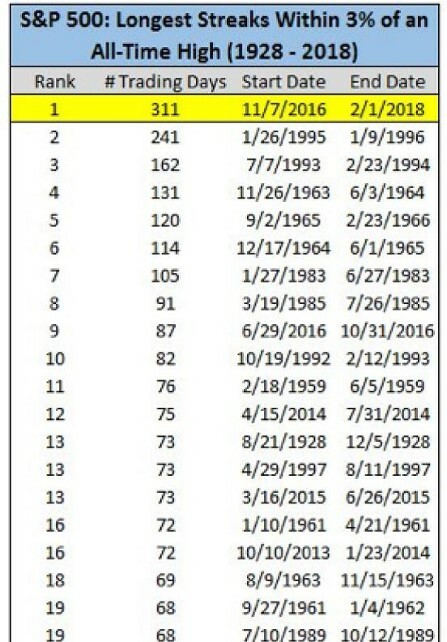 The S&P 500 has now officially ended its longest streak without a 3% drop in its history—as you can see from the accompanying chart. It’s an historic run not likely to be seen by any of us again. The truth about the markets is that short, sharp pullbacks are inevitable and routine—unless you were living in the past year and a half, when we seemed to be immune from normal market behavior.